Hello followers and friends! First of all I want to thank you all for the wonderful comments on my last card. WOW! I was overwhelmed by your kindness. Today's card is also inspired by a Viva la Verve Sketch. 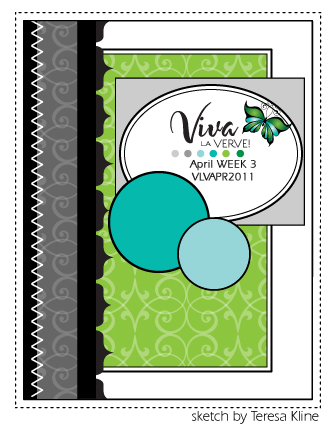 This sketch was designed by Verve Diva Teresa. I feel that I must warn you and tell you that I have gone in a totally different direction for this card. I got 'grungy'. Lots of distressed edges and direct to paper inked background base. The inspiration for this idea came from this week's Bible Verse Thursday challenge 104 @ Christian Paper Crafts:Wilderness. Sometimes our trials in this life make us feel as if we are living in the wilderness. With that thought in mind I created this distressed, roughed-up, grunged card as a symbolism of wilderness and I including a scripture on the front that encourages me when I feel like I am walking in life's wilderness. 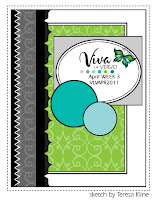 All the patterned papers on here are from K & Co. Also from K&Co. is a translucent frame, journaling tag (sentiment is stamped on), sunflower border, and two little daisy accents that are popped up with pop-dots but, it's hard to tell that in the photo. I took a Very Vanilla cardstock base and used a Tim Holtz distress ink in Fired Brick along with the direct-to-paper inking technique to create the base of the card. The scripture stamp is from Sweet n Sassy stamps. It's very different from what I normally do and I think it could be better but, it could take a while to master the grunge style! I like the grungy look! LOVE those roughed edges too. I forget to use my edge distressor and it hangs right infront of me! This is sooo pretty! I love the papers and the cool design. The distressing is perfect. I think the grungy look suits your card making - this is a vision of loveliness! I like the stark, rich colors and the design is over the top eye catchy! Great job! LOVE your blog & spiritual connection that it has - and your quote is phenomenal :) Blessings! I'm loving it! You did a fantastic job, and the verse is lovely. I hope you had a wonderful and blessed Easter. Love your blog!!! 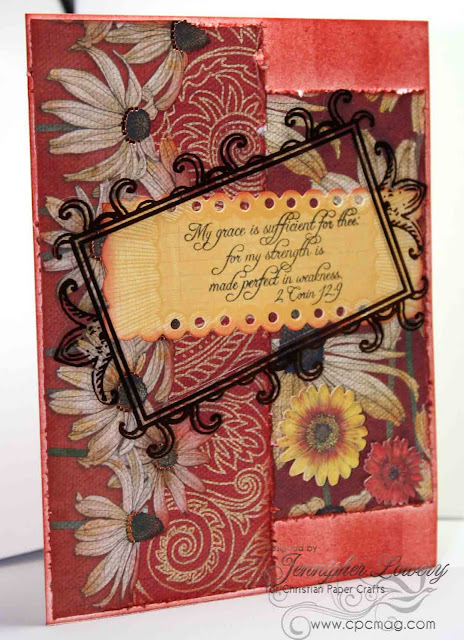 Your card is beautiful, I love the "grungy" distressed look it is perfect and fits the inspiration. Love how you did the frame on the front. Have a wonderful weekend. Your card is beautiful! There are a lot of things going on but it all works so well together! Another beautiful card! I love the distressing, and all of your papers just go together so well. That frame right over all the layers is just perfection, too! Beautiful! The colors are gorgeous and I love the slant of the frame, so pretty! This is just gorgeous Jennipher! I do love everything about it...TFS Hun!!!! Great card!! Love all the different papers! Oh, I think you did an awesome job with the grunge look! Love the colors and the lopsided frame! Beautiful card, tfs, and all the papers are gorgeous. Superb color coordination! Love the rustic feel! Just beautiful!